By LMFAO featuring Lauren Bennett. Arranged by MJ Summer. Sheet Music Single. 8 pages. Published by EnjoyPianoMusic.com, LLC (H0.128215-219485). 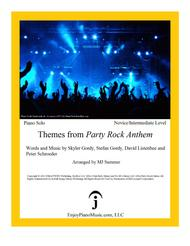 This arrangement includes all the themes from the entire song. You can entertain and impress your guests at parties with it! Visit EnjoyPianoMusic.com for more arrangements of piano students' favorites and popular titles.